What better day to discuss proposals than Valentine’s Day? Festive Lights recently ran a survey, which was featured in Brides Magazine, and the results showed that the most popular time of year for proposals is Christmas, followed by Valentine’s Day. I can’t say I’m surprised, there’s something so magical about Christmas, even as an adult, so what better time to pop the question? Valentine’s Day tends to get a lot of bad press. Perhaps it is a little over commercialised these days, but the sentiment behind the holiday is lovely, and many choose this romantic time of year to dedicate the rest of their life to the one they love. With this in mind, I thought it would be nice to take this opportinity to share with you my own proposal story. Even though it didn’t take place on either of these occasions, it was perfect for me and it’s something I will cherish forever. Ed and I had been talking about getting married for a few months before he proposed. I had been married before, and I was more practical about things the second time round. I didn’t want to rush into another marriage, but at the same time I knew that this time was different, and that Ed was the man I was meant to spend the rest of my life with. It was August and I had recently started a position in a new build hotel and was under a huge amount of pressure, barely sleeping and generally incredibly stressed. Ed had received tickets to see Avenue Q, and I must admit I was not looking forward to going when I left work that day. I find puppets incredibly scary, and all I really wanted to do was go home, sit back with a glass of wine and chill out. I was on the phone to my mum as I walked back to my car, and I remember getting very angry as I reached it and saw what I thought was a parking ticket on it. Huffing and puffing about it, and still on the phone to my mum, I opened the envelope up to see that in fact it was the start of a very elaborate proposal treasure hunt Ed had orchestrated. My first card told me I would find my gym clothes in the boot of my car and that I would need to get across town to the local Wetherspoons within a certain amount of time in order to receive my next card. My mum was still on the phone and I read it out to her, so she was aware what was going on. I asked her to keep quiet for the time being and hurriedly changed in the back of my car before running off to the pub, where I was met by our friend Sarah, who had the next card and a drink for me. I had to answer three questions about Ed in order to receive my next card from Sarah. I actually only got two right, but Ed let me off, two out of three ain’t bad, right? Hurrying home, as my next card instructed me to, I changed into a dress and posted a quick selfie onto Facebook as I had been told to. Ed commented with a clue as to where my next card would be hiding around the house, and I excitedly opened it. A taxi was due to pick me up imminently to take me to our favourite restaurant – Banana Wharf on Poole Quay. It was fortunate that this part wasn’t a surprise as the taxi driver rather annoyingly didn’t seem to know the area well and asked me for directions! When I arrived, Ed was sat at a table overlooking the water, with a glass of Prosecco ready for me. 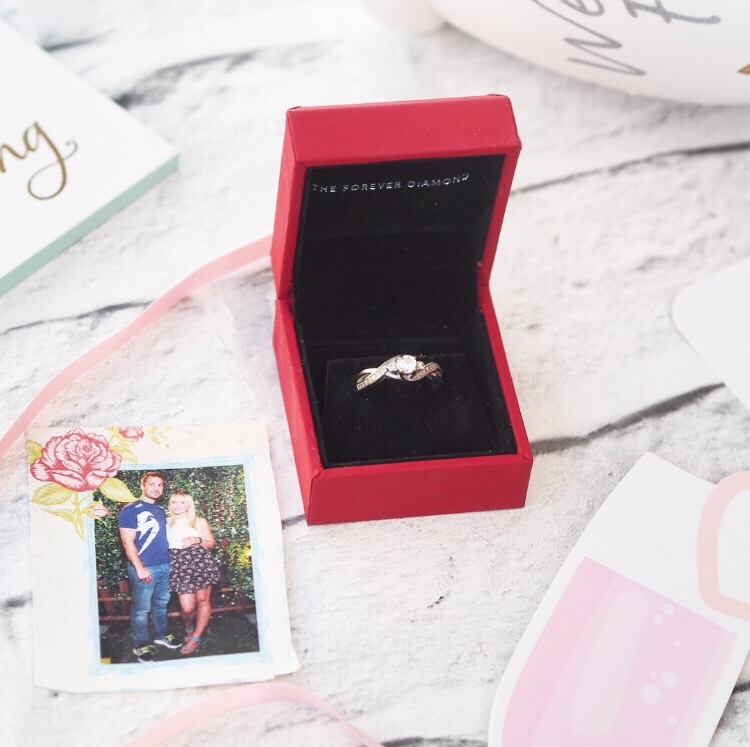 He handed over the very last envelope and as I read through the card, he got down on one knee next to me and held out the most beautiful ring, whilst asking me to be his wife. It was truly the most incredible moment in my life, so romantic and absolutely the most amazing thing anybody has ever done for me. He had put so much thought and effort into making the proposal special for us. If you recently got engaged, whether over Christmas or Valentine’s Day, or another time entirely, Festive Lights have written some fantastic tips for getting a start on your wedding planning. I totally agree with them that you should book early if you have your heart set on a particular date or popular venue, as these will get booked up far in advance. However, if you aren’t that fussed about a certain date, it is worth considering having your wedding day during the off peak season. Venues often have offers available for their less popular times of year, and you can generally get a lot more for your money across the board at these times. Bear in mind that December is usually busy for Christmas parties in a lot of venues, but November, January, February and early March are usually much quieter times for the wedding industry. If you do go for a wedding at these times of year, bear in mind that it will get dark earlier than during the summer, and there will be less natural daylight. This is especially important when considering your photos from the day, so make sure you discuss this with your photographer and ask to see examples of their work in low lighting conditions. It is definitely worth checking out Festive Light’s range of lighting options to brighten up your venue, especially for weddings during Autumn/Winter. I particularly like their festoon lighting, especially for a marquee wedding, and their light up letters would add the perfect personalised touch to any wedding. Totally affordable, with free delivery on all orders over £50, and a 12 month warranty included, the site will help spark your creativity when it comes to planning your special day. I know it sounds boring, but I always suggest sitting down and working out a budget as soon as possible after getting engaged, so that you go into planning knowing what you want, and what you can afford. As Festive Lights general manager Stephen Alty says in the article in Brides magazine, it can be so easy to get carried away with a Pinterest dream wedding, but it’s important to be realistic about your budget. It’s still totally feasible to have a beautiful wedding day, either by making small compromises, or having a longer engagement to give you the chance to save up, just don’t get yourself into debt for the sake of your big day. This is a collaborative post with Festive Lights, however all words and photos are my own. Oh I love your proposal! My boyfriend and I have been together for 8 years now, and have discussed getting married by the end of this year. Omg that’s such a beautiful story! How romantic and well thought out!! this is the cutest story ever. he did so well planning all that.